Should government agencies poll their ‘customers’? “How am I doing?” Years ago, the mayor of New York, Ed Koch, stood on street corners and asked this of everyone he met. His accent was distinctive, but he was far from alone: Politicians need to know how they’re doing because their jobs depend on it. This year, Washington is awash with polls. Some candidates tout them in preference to talking about issues. Other candidates avoid talking about them. Nonetheless, they all pay attention to them. But, in poll-obsessed Washington, guess who doesn’t always take polls — and more often, doesn’t always pay attention to them? America’s largest service organization: the U.S. government. That’s a shame, because paying attention is the key to better service for government, too. In 2010, I became head of a midsize federal agency, the Pension Benefit Guaranty Corp. If you’ve never heard of PBGC, you’re lucky, because the agency takes over pension plans after companies go bankrupt and people have lost their jobs. As a result, most people who have heard of PBGC aren’t all that happy to be its customer. Fortunately, PBGC staffers are excellent. They work hard to reassure folks that, though they may not get their full pension, they will get something thanks to PBGC. Unlike some agencies, PBGC has for many years surveyed its “customers” — with the American Customer Satisfaction Index (ACSI) used by private companies. 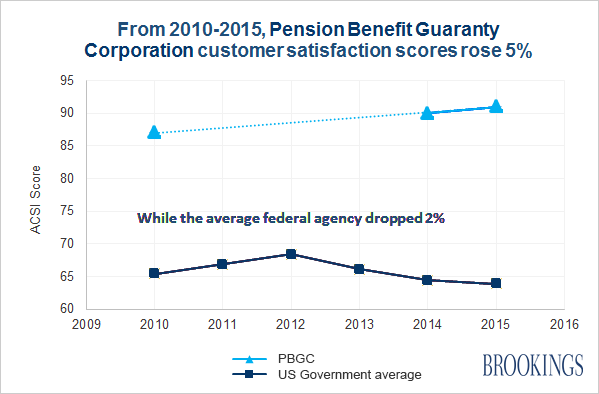 When I arrived at PBGC, the customer satisfaction scores were good: Even though the agency had made some mistakes — like miscounting the pensions of airline employees and steelworkers — its ACSI scores were higher than most federal agencies. But there’s always room for improvement. We started by making sure that everyone at PBGC knew what our customer satisfaction scores were: They popped up on everyone’s computer screen in the morning. The bonus got folks’ attention: PBGC improved its website, increased customer contacts and started providing more information. Six months later, the agency earned the bonus. So we raised the bar and offered it again. We didn’t stop there. I thought, “Maybe we should try some of our own medicine.” So we started an internal customer-satisfaction survey. We also put customer satisfaction into management’s evaluation criteria, so the surveys could affect a manager’s rating and pay. These, too, were controversial — but a surprising number of PBGC offices somehow managed to raise their scores. After four years, I left PBGC. Over the period from 2010 to 2015, PBGC’s customer satisfaction scores rose 5 percent. They are now the highest in the federal government — and higher than those of Amazon, Nordstrom and Chick-Fil-A, which are considered the best in American business. Over the same period, the average federal agency’s ACSI rating dropped 2 points. Shouldn’t government’s customers have a voice? PBGC is not alone. There are many government agencies that pay attention to customers. The Passport Service is famous for it. The government’s landlord and stationery store, the General Services Administration, regularly surveys its customers. GSA’s Buildings Service, e.g., surveys its tenants both annually and after major projects. Furthermore, customer evaluations are included in the ratings of GSA senior management and some front-line employees. This works: GSA’s scores went up 3 points in the last year alone. Unfortunately, not everyone is “with the program.” Many federal agencies have an unspoken goal of receiving as few complaints as possible. They view surveys as just making it easier for people to complain. In one sense, they’re right: People are likelier to respond if they have extreme views, especially if they’re unhappy — and the IRS will never win a popularity contest. What these agencies are missing are the benefits of connecting with the people they serve. Surveys let people know that they matter (about which, at least for some agencies, there’s a lot of doubt). Surveys also help agencies get smarter about how to serve — if they’re willing to act on them. Many federal agencies take surveys, but the real challenge is using them to provide better service. Even when the results are disappointing, surveys provide a baseline both to encourage improvement and to confirm that it’s achieved. And, as we found at PBGC, paying attention to customer satisfaction surveys can both encourage and reward better service. For more than 20 years, federal agencies have been required to set goals and measure their performance. Let’s encourage them to measure it from the people they actually serve. Editor’s note: A version of this piece originally appeared on Inside Sources.